Each day this week I will discuss topics from C. G. Jung’s The Red Book, along with my perspective and then continue the nature series with individual birds of prey that I have observed here on Turk’s Mountain. In this first section of The Red Book, there are eleven short chapters with a brief prologue. Jung shares his internal conversations and struggle for his soul. He recognizes that the search is within. His places great importance on his dreams as he vision-quests in a dream of the desert to leave behind desire, descends into hell to slay his demons, and finally returns to resurrect his soul. His words are of his contemporary world, religion and gestalt of the turn of the last century. He speaks in the language of the Bible, attempting to resolve mythology with biblical references. He seems to want to rebuild all of his prior misconceptions into a new understanding within the same framework of the Bible. He has conversations with Biblical characters in order to resolve continuing issues. With the deepest respect, I think that only Jung truly knows what has led him to these musings. They are based on a lifetime of experience, the defining moments and deeply-rooted meaning in his mind. At times, Jung feels that he faces certain madness, particularly as he interprets his own paintings of the dreams. I detect real honesty and innocence in his manic reflections, albeit in a pitiful and self-deprecating manner. It is very tiring to read this as witness to his pain and suffering. It would seem to this observer that most of his struggle has been brought on by his religious and societal upbringing. While his objective is to resurrect his soul, he attempts that within the context of his religious and biblical beliefs. In this way, he has not apparently transcended his world view, but has just reshuffled it. So it is unclear to me whether he sees his struggle metaphorically or from this more concrete perspective. Of course I am not yet finished, so we will see. And, now on to today’s nature topic - the birds of prey, a reminder to us that life lives off of life. Each of these creatures have informed me and made my life fuller. I salute each of them and show my deep respect with this small recognition. 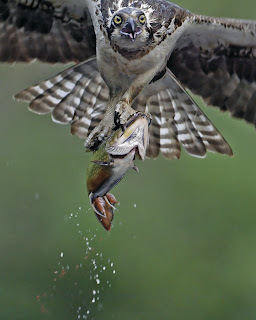 The Osprey or Fish Hawk is a common sight in the area of the Chesapeake Bay. Several years ago, I lived about a mile from the Bay on a small horse farm with a 3 acre pond. The Osprey would visit and fish there. What a sight! An Osprey would appear just above the tree tops flapping slowly, gradually circle the pond and then dive into the water head first. In the dive into the water this large bird (little smaller than the red-tailed hawk - 22”) disappears for a few moments. More often than not they’d exit the water with a small fish in their talons, only to slowly flap away back to their nest, dinner in hand. It all happens so quickly, you could easily miss the brief experience. The Osprey competes with the Bald Eagle in the Chesapeake watershed, and like the Bald Eagle was threatened back in the 1960’s by the use of pesticides. In my experience, and anybody who sails or boats on the Chesapeake, this majestic bird has made a great comeback and their large nests can be seen at every port of call, on the marker buoys and posts.